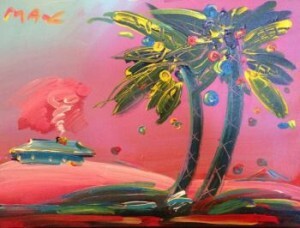 At Barnett Fine Art, we are pleased to offer four special works by the prolific German artist, Peter Max. In this week’s blog, you can peruse this work while learning about Peter’s life, early influences, and the experiences that have helped inform his artistic style. 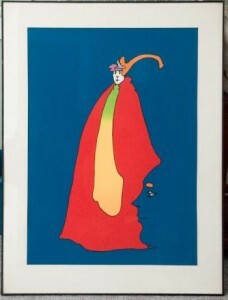 One of the most influential artists of the 20th century, Peter Max has produced an iconic archive of work that is distinctive in its vision. 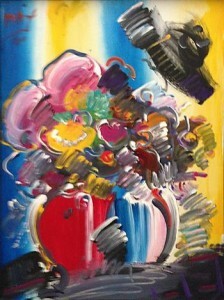 His style has been termed “cosmic art” for its use of bold colors and imagery reminiscent of hallucinations, often juxtaposed against complex backgrounds. Max has cited his childhood as a major source of inspiration for his work: After moving to Shanghai from Germany at the age of 1, he discovered comic books which sparked his love for pop art. Moving from China to Tibet to France, Max developed a unique aesthetic that was greatly influenced by the bold and bright colors of his early surroundings. After settling in the United States, Max began formal studies at the Art Students League in Manhattan. He was commissioned to create the cover art for an album by Meade Lux Lewis, a prominent blues pianist, and with this opportunity Max’s career suddenly took off. His cover art won the Society of Illustrators award which sparked an outpouring of interest in his work and catapulted him into the national spotlight. At the height of his popularity in the 1960s, Max’s work was often lauded for visually capturing the zeitgeist of the era in the way that the Beatles did through their music. He was the first artist to ever experiment with mass production and licensing deals and as a result his art has graced American postage stamps, countless product posters, and the cover of Life magazine, as well as numerous gallery walls and home collections. 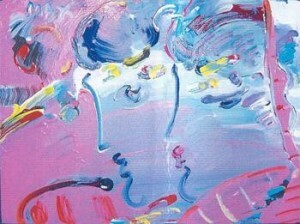 Peter Max has been in the news recently in regards to an unusual event. He was held hostage by his son Adam Max who claims that he was protecting his father from his step-mother, Mary Max. Yet Mary argued that Peter, who is suffering from early-stage dementia, was being held against his will and went to court to request that he be returned home. The judge sided with Mary and the two were reunited. Read more here. Known for exploring themes such as peace, love, and patriotism, Max has created a body of work that offers an unmistakable glimpse of the psychedelic 60s. This entry was posted on Monday, November 2nd, 2015	at 1:41 pm	and is filed under Artists Biography	. Both comments and pings are currently closed.